Buchanan Computing's involvement with the new chapters and bringing you up to speed on them. 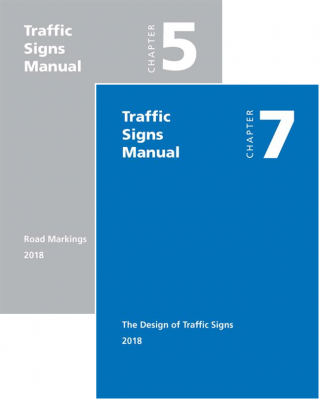 We are delighted to announce that all the eagerly anticipated revisions to Traffic Signs Manual chapters are now available as PDF downloads from the DfT website, and that all except Chapter 3 (regulatory signs) may be purchased in print from the TSO shop. The only work in progress still missing is Chapter 6 on traffic control and pedestrain crossings, which is expected later this year. In his role as chair of the Institue of Highway Engineers’ traffic signs panel, Simon Morgan has been closely involved in the development of the new chapters, including authoring parts of them and creating some diagrams from SignPlot. He gives some of the background to this and summarises what’s new in this Transport Network article here. Simon is speaking on the subject: Can the new Traffic Signs Manual help influence driver behaviour? at Traffex on Wednesday 3 April at 14.20 in the Highways & Transport Theatre, and is giving in depth full day briefings on the changes and how to make use of them at full day seminars, the first of which is on 30 April (detalis here). He has also been beeoked to deliver it at several individual authorites’ premises. Please email us if you are interested in either option. Speaking of Traffex, if you are visitng please come and meet us on stand C8 (immediately to the left as you enter the hall). We have lots of exciting developments to show you to make your life easier. Click here to view all selected news stories.